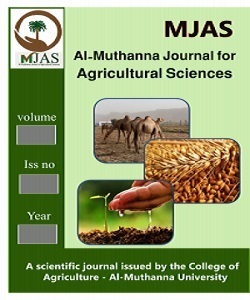 The effect of the concentration of 2,4-D in the production of vegetable oils Linoleic acid and Oleic acid from callus sunflower Helianthus annus L.
تأثير تراكيز2,4-D في انتاج الزيوت النباتيةLinoleic acid and Oleic acid من كالس نبات زهرة الشمسHelianthus annus L.
This study carried out in the laboratory of plant tissue culture of the College of Technology / Musayyib in order to determine the effect of different concentrations of 2,4-Dihydroxyphenoxy acetic acid 2,4-D)) in the production of vegetable oils Linoleic acid and Oleic acid from callus sunflower seeds Helianthus annus L . Sterilized seeds were planted after removing the cover on the central sterile and MS Almjhzb 2,4-D concentrations 2.0,1.5,1.0,0.5,0.2,0.1,0.0 ) mg / L) and took the results after 40 days from sowing . The results showed the superiority concentrations ( 1.5 to 1.0) mg / L 2,4-D morally " in the average weight of the soft callus concentrations as compared to the rest gave ( 20.2 and 20.6 ) g on the relay , while the treatment did not give any response to the control callus formation . It was the Tercizin themselves significant effect in increasing the average dry weight morally " concentrations as compared to the rest gave moderate " amount ( 5.8 and 6.1 ) g on the relay . Aydan and the results showed a higher amount of oil Oleic acid concentration was at 2.0 mg / L 2,4-D , reaching 0.68 mg / g dry weight , which differed significantly " from the rest of concentrations except focus 1.5 mg / L ( 0.60 mg / g dry weight) , while the highest amount of oil Linoleic acid concentration was at 1.0 mg / L 2,4-D , amounting to 0.80 mg / g dry weight , which significantly exceeded " all concentrations , in terms of this amount was significantly decreased in high concentrations of 2,4-D and down " to lower the amount of focus when 2.0 mg / L 2,4-D , which amounted to 0.40 mg / g dry weight . conclude that the amount of vegetable oil to increase in callus increasing the concentration of 2,4-D in the diet compared to the control center .نفذت هذه الدراسة في مختبر زراعة الأنسجة النباتية التابع للكلية التقنية / المسيب بهدف معرفة تأثير تراكيز مختلفة من 2,4-Dihydroxyphenoxy acetic acid 2,4-D)) في أنتاج الزيوت النباتية Linoleic acid and Oleic acid من كالس بذور زهرة الشمس Helianthus annus L. زرعت البذور المعقمة بعد ازالة غلافها على وسط MS المعقم والمجهزبـ 2,4-Dبالتراكيز 2.0,1.5,1.0,0.5,0.2,0.1,0.0) ) ملغم/لتر وأخذت النتائج بعد 40 يوما من الزراعة. اظهرت النتائج تفوق التركيزين (1.5و1.0) ملغم/لتر2,4-D معنويا" في متوسط الوزن الطري للكالس مقارنة ببقية التراكيز اذ أعطيا ( 20.2 و20.6) غم على التتابع، في حين لم تعط معاملة السيطرة أية أستجابة لتكوين الكالس. وكان للتركيزين نفسيهما تأثير معنوي في زيادة متوسط الوزن الجاف معنويا" مقارنة ببقية التراكيز اذ أعطيا متوسطا" بلغ ( 5.8و6.1) غم على التتابع. و بينت النتائج ايضاأن أعلى كمية لزيت Oleic acid كانت عند التركيز 2.0 ملغم/لتر 2,4-D حيث بلغت 0.68ملغم/غم وزن جاف والتي اختلفت معنويا" عن بقية التراكيز باستثناء التركيز 1.5ملغم/لتر (0.60ملغم/غم وزن جاف )، بينما اعلى كمية لزيت Linoleic acid كانت عند التركيز 1.0 ملغم /لتر 2,4-D اذ بلغت 0.80 ملغم /غم وزن جاف والتي فاقت معنويا " جميع التراكيز , في حيث انخفضت هذه الكمية معنويا في التراكيز المرتفعة من 2,4-D وصولا" الى اقل كمية عند التركيز 2.0 ملغم /لتر 2,4-D والتي بلغت 0.40 ملغم /غم وزن جاف.نستنتج من ذلك أن كمية الزيت النباتي تزداد في الكالس بزيادة تركيز 2,4-D في الوسط الغذائي مقارنة بالسيطرة.